Wish you a very happy New Year and Welcome to 2012. Though 2011 year is little adventurous with our move to India and settling down, it went like a breeze. Despite of all those busy days, vacations, move to India, meeting friends and trying local foods I was able to keep up the posts coming in my blog. (I don't know how, but i did!!). Today i sat down and went through some of my posts in 2011 which left me in the memory lane for a while. I always believe in history and at the same time I always welcome change that happens in future also. While History is the inspiration and Future is the Motivation. 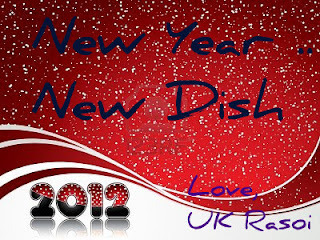 My successful recipes and food experiences of 2011 inspired me to continue with the same pace, and I am motivated to do that in 2012. (Hurray!! that means more recipes for you ;-)). Thank you for all your wishes and support!!! It's enough for philosophy (and Thanks for listening!!! ), so coming to my recipe, today I am going to present a unique recipe with Plantain (Thanks to my friend Archana who made me addicted to this Fruit/Veggie with her recent event). During my recent trip to HYD, I have learnt this recipe from my dear Anu Atta. VJ and me were digging through the whole bowl, and then only I was determined to learn this recipe and adding to my routine chutney's list. Seriously, this is one more best way to eat Plantain, the spices used in the chutney and the creaminess from Yogurt makes this chutney unique and delicious. I am hooked on to this recipe, if you are ready for that, why late and try it.. Here I am sharing the recipe.. Enjoy!!! In a non stick pan heat the oil and add cumin seeds and turmeric. Once they start splutter add the sliced ginger pieces and green chili and saute them for 3 min. Turn off the heat and grind the Plantain, Green Chili and Ginger along with salt in the mixie (until it becomes smooth). Mix the Yogurt to the chutney and mix it well. Now add the Indian Tempering to this Chutney and it is Done now. I tried this with Chapati and It tasted so good, and goes very well with Hot White Rice. Usually we use Garlic in chutneys, but this one is exception. Garlic does not go well with this cooked plantain. So intentionally i didn't add it. Some Plantains might be heavy in starch, will be very sticky. In that case you might need more yogurt. If the chutney becomes little thick (after a while it becomes) don't hesitate to add some more yogurt. This chutney tastes good when it is freshly made. As time lasts it becomes little thick. Happy new year !! this is super yummy dish.. Happy new year Wishes Mythreyi..Plaintain yogurt pachadi looks super delicious. Thanks for the mention dear. Happy New Year Mythreyi! Pachadi looks yumm. In Kerala we have so many varieties of pachadi but we dont have with raw plantain. Will surely try it.